When consumers consider social media sites like Facebook, they might think of status updates, photos, events, and several other features. However, there are a number of “business” aspects that might come to mind too. Specifically, consumers might think of brands on Facebook and their use of advertising. Engaging with those brands through liking and sharing content is all a part of business strategy, but how much difference does a “like” make exactly? Perhaps not that much, according to researchers from Tulane University. 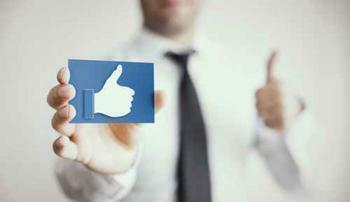 "When we think of Facebook, we think of it as a very social platform. Most companies think that those social interactions will lead to more customer loyalty and more profitable customers," said lead author Daniel Mochon. "That's not necessarily the case. Customers rarely post on a brand's page on their own and typically only see a fraction of a brand's Facebook content unless they are targeted with paid advertising"
The researchers tested their assertions by measuring consumers’ engagement with a wellness program called Discovery Vitality. Participants were able to earn program points by taking part in healthful behaviors like exercising. With this model, the researchers set out to see if people would try to earn more points if they liked the program’s Facebook page. Invites to like the page and take a survey were sent out to one group, while those who were not invited acted as the control group. After four months, the researchers found no difference between the amount of reward points each group earned, suggesting that simply “liking” the page didn’t make much of a difference. However, in phase two of the experiment, Vitality paid Facebook to display two of its posts to members who liked the page per week. After two months, those who liked the page earned 8% more reward points than the control group. The researchers think the ads were effective because it boosted Vitality’s reach, ensuring that its content would reach participants’ timelines. They say that the findings provide some evidence for how companies may want to use social media in the future. "To our knowledge this is the first causal demonstration of the effect of Facebook page liking on customer behavior -- specifically behavior that takes place offline. The results suggest that Facebook pages are most effective when they are used as a form of traditional advertising rather than as a platform for social interactions," said Janet Schwartz, assistant professor of marketing at Tulane. The full study has been published in the Journal of Marketing Research.